﻿﻿Meetings are always free! No need to register--just show up! We meet in Abingdon, Bristol, Glade Spring, and Damascus to meet the needs of area moms-to-be looking for pregnancy information in a group setting. 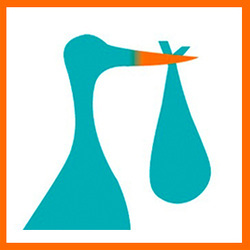 growing families and learn about healthy pregnancies and healthy babies. Attend as many sessions as you wish. Call 276-608-6824 for more info. calendar for dates, times & topics. Did you know you can earn a free SleepSack? 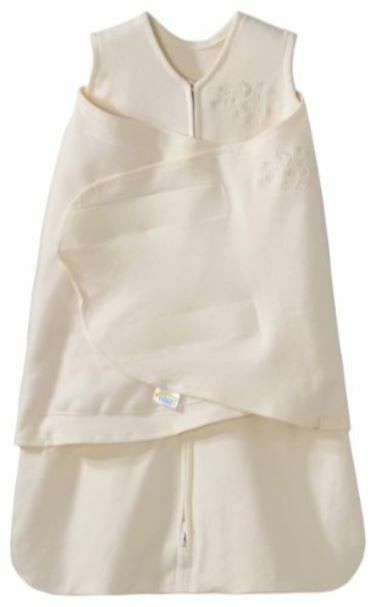 Baby Basics Moms Club awards a free snugly SleepSack for your new baby to any of our moms-to-be who complete all six of our core topics. Each topic is aimed at helping you have a healthier pregnancy. 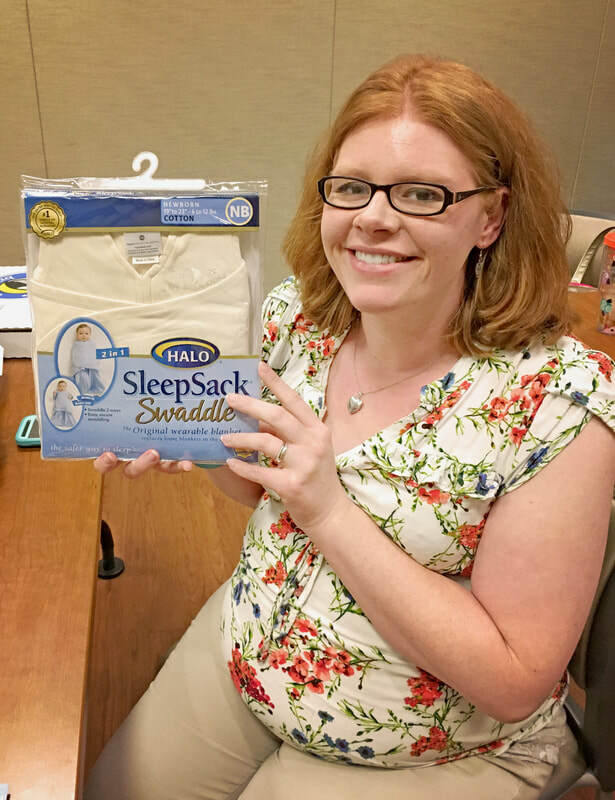 Our most recent SleepSack went to Christie who attends our Abingdon Moms Club. For more information on this any any questions about Moms Club, contact our facilitator Lisa Dolinger or drop by any meeting. You can check the calendar for meeting dates and it doesn't matter what month your pregnancy is in. So if you're a mom-to-be, we look forward to seeing you soon! Special thanks to Frye-Shaffer Insurance for our garden space. 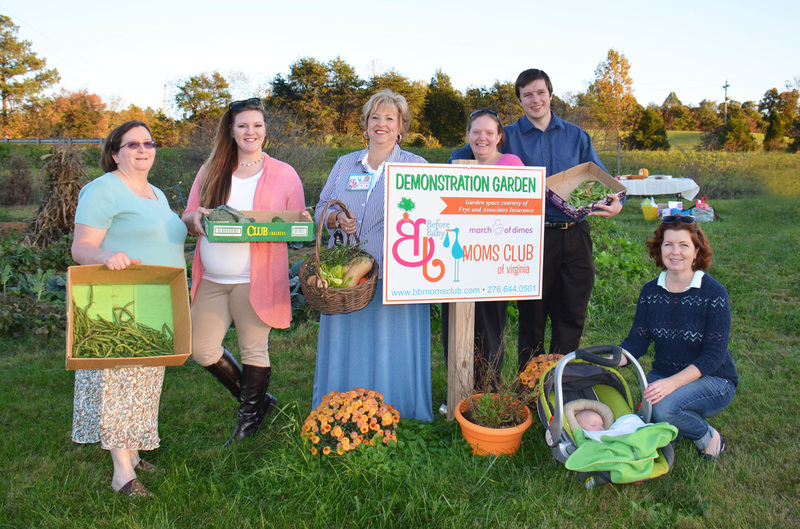 For the second year, our Moms Club Demonstration Garden produced a bountiful harvest of vegetables, fun, and education for all. 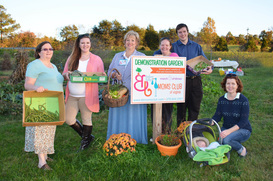 Thanks to all our moms, dads, and support partners who helped with the garden this year! Throughout the season, those tending the garden shared many types of veggies while receiving tips on preparing fresh dishes and growing their own gardens. Moms Club Will Celebrate Five Years on September 28th, 2015! ﻿﻿Th﻿e ﻿Baby Basics Moms Club Reunion﻿﻿ was held at Sugar Hollow Park in Bristol on Monday, September 22nd from 5:30 to 7 p.m. All past and present moms and support partners from our Abingdon, Washington CO. Health Dept and Wellmont Bristol Regional Medical Center were invited to join us for a BBQ dinner showcasing the wonderful harvest from the Moms Club Demonstration Garden. Our funders and partners also joined us in celebrating of our fourth birthday for Moms Club. We had a great time at Bristol Regional Medical Center's 2014 Women's & Children's Expo. 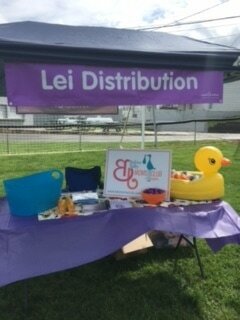 There were many other vendors with tables and displays of great products and services. Merry, Linda, and Karen gave away some great prizes and enjoyed talking to expectant moms about how Baby Basics Moms Club can help with their pregnancy and what may available for moms & babies in the community. We also saw some familiar faces of some of our past Moms Club "graduates" and their little ones. 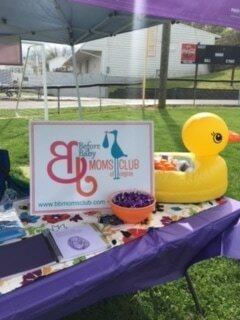 On February 25, 2014, the newly formed Washington County Baby Basics Moms Club (formerly Abingdon Moms Club) began offering club meetings at two locations in Washington County. We are proud to announce our two new community partners which will be hosting our Baby Basics Moms Club meetings. Johnston Memorial Hospital of Mountain States Health Alliance has generously provided meeting space in their Family Birthing Center. Our second Moms Club will be meeting at the Washington County Health Department which is part of Mount Rogers Health District of the Virginia Department of Health. Complete information about each location and dates can be found by clicking on "View Calendar". We hope to see you at one of our locations soon to learn and share with other expecting moms. Smiling faces, pregnant bellies and shopping carts were showcased at Food City Grocery in Abingdon on September 17th, 2013. Baby Basics Moms Club of Abingdon visited the grocery store for a one-on-one with Audrey Kessler (left), Food City Registered Dietician. Click here for more photos. The group participated in a 'perimeter' tour of the store. 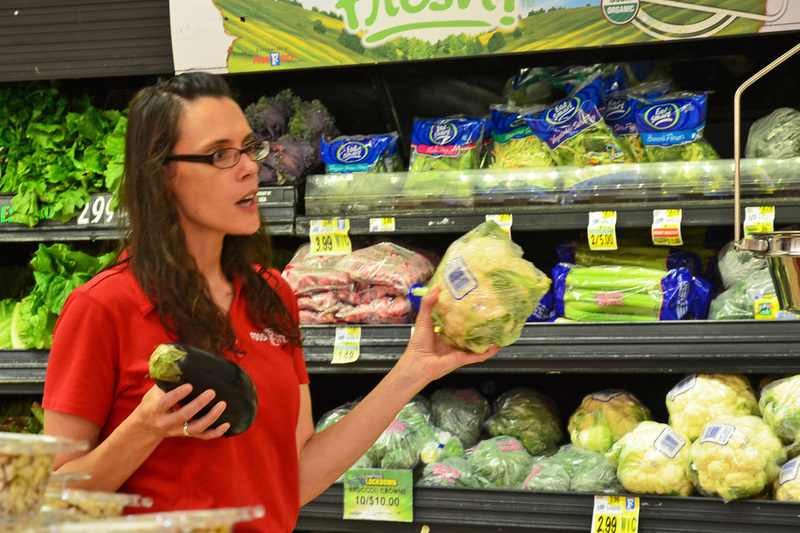 “A perimeter tour," explained Ms. Kessler, "is where the healthiest foods are found when shopping; produce, meats, bread and dairy.” Moms were given tips about making healthier selections and shopping on a budget. Food City offers the NuVal system which assigns a number up to 100 based on the nutritional value of an item, giving our moms-to-be a whole new way to comparison shop. Following the shopping, our pregnant moms-to-be were treated to dinner from the Food City salad bar. “What a great way to learn more about making the best possible choices and still work within a budget” one mom said. 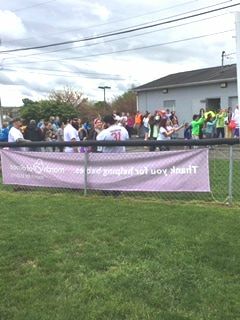 “Food City has been a wonderful partner with Baby Basics Moms Club for almost two years now," noted Karen Thompson, a Moms Club facilitator. "We are excited about the expansion of our nutrition component at club meetings and encourage all pregnant women to attend Baby Basics Moms Club to learn more about having a healthy baby and a healthy pregnancy. "